ChannalBAC provides the means to lower your cost and improve quality. That is why more than 75% of the US Flexo Newspapers have converted to or are testing ChannalBAC! Looking for a way to obtain your "Sustainability Goals" and reduce your "Carbon Footprint?" ChannalBAC can help! The idle labor when a cushion needs to be replaced due to a wrap If it's at deadline, it's not just the press operators that are delayed, bindery, shipping, and trucking are all affected. Since the life of the cellular cushion is significantly shorter, cushions are required to be replaced more frequently. How many hours do you budget each year for the labor required to change out cellular cushions? 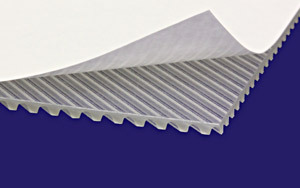 ChannalBAC newsprint is now available in 2 densities, standard and high density. The new high density cushions are designed to further improve solid ink density and reduced mottling. So how long will a ChannalBAC cushion last? The truth is... we just don't know... and may not know for years! 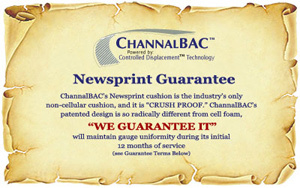 But what we do know is ChannalBAC is "CHRUSH-PROOF", and CDT Guarantees it! That's right, take a wrap and keep on running... you can't do that with cellular foam! 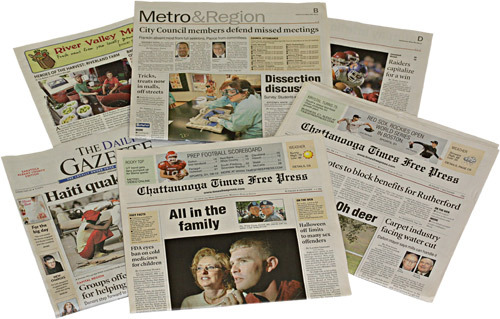 ChannalBAC Newsprint is custom manufactured, based on your press requirements. Isn't time you take a test drive yourself?